I bought this saw a few months back because I needed better accuracy than my old RAS could deliver consistently. I did a bit of research comparing models, prices, sizes, and I liked the feel and action of this saw the best, as I didn’t really want or need a 12 inch miter saw if I could get one in the 10 inch range that could cut a dimensional 4×4 if need be. After using it for crosscuts, bevels and miters over the past few months I can say that I am really happy with my purchase and in all areas it has delivered and is just a joy to use. This saw is a double bevel sliding miter saw with a crosscutting capablity to 12 inches at 90 degrees and a vertical capacity to 4 3/4 inches. It has a direct drive motor that is angled upward so that it can deliver more of a vertical cut both left and right of the blade than many other of the 10 inch miter saws. It comes with a good stock blade, a soft start feature which is great and a darn quiet direct drive motor with great power and a blade brake. The blade wrench stores on the tool in a snap in holder and the other end of it is a hex wrench to adjust the bevel bolts. It has an independent laser switch on the handle that is easily left or right blade side adjustable and puts out a thin line like a mechanical pencil line, so that it is very easy to use and hit your cut line on the money. Out of the box the saw was set up pretty close and just needed a little tweaking on the left bevel at 45, right bevel was dead on, and a minor adjustment to the vertical 90. I used a Wixey digital angle gauge for these adjustments, which took about 2 minutes. The fences were square to the blade, and though I had bought a Freud thin kerf 60 tooth 5 degree negative hook for the saw, it is still in its package as the stock thin kerf Makita of the same specs is really quite a good blade. I had read on Amazon reviews of many people complaining of the sliding action being rough on the top set of slide rails, this has not been the case on mine, and both sets of rails slide smoothly and can be independently locked out if need be. Also having read that there was a soft stop on the 90 vertical bevel gauge, that some contractors complained about I wasn’t concerned about that as I knew I would put the Wixey on it anyway when returning to zero from a bevel. The surprise is that once I did the simple bolt adjustment for the vertical 90, I have checked it every time after returning from a bevel cut and it now clicks in place and registers dead on 90 every time. So it was only a soft return that had some play until the intial set up was completed. Dust collection is never great with miter saws as we all know and I have this one hooked up to both a 4 inch dust hood and a 1.5 inch connector from the saws dust port to my DC. This working okay for now but I am going to have to build a little more enclosed back and side surrounding the dust hood to capture any escaping dust. So, after this lengthy review I’ll close it out and say, to me this is a saw seriously worth considering if you are shopping for a versatile miter saw. I bought this saw 2 months ago and like you after months of research a note comparisions. I even went and looked at a Kapex just to see what 1300 dollar saw looked like. Everything you have described is exactly what I found…this saw is soo accurate and slides so smoothly it was amazing. What I really liked is the double slide componant. it doesn’t have as large of a footprint as most miter saws buit it is still larger than the Kapex. The stock blade is more than adequate for most cuts and I get very little tare out with a backer board if any at all. Nicely written review. You don’t mention where you ended up buying it or how much it cost you. Sometimes we have to buy things when the need arises but I hope you got a good buy on it. Continued good luck with your new toy. Bought it at Home Depot. Found lowest price on internet I could and printed it out and took it to them and asked for a price match. Saved me $70 over their asking price and I got the 90 day return policy, which can be nice to have but not necessary as it turned out. So I got what I think was a good fair deal, kept my money local, and the saw is great so win win. I have an older version of the same saw. With respect to accuracy and smoothness, this saw is as good as it gets. After about 5 years of operation, it still performs like a champ. 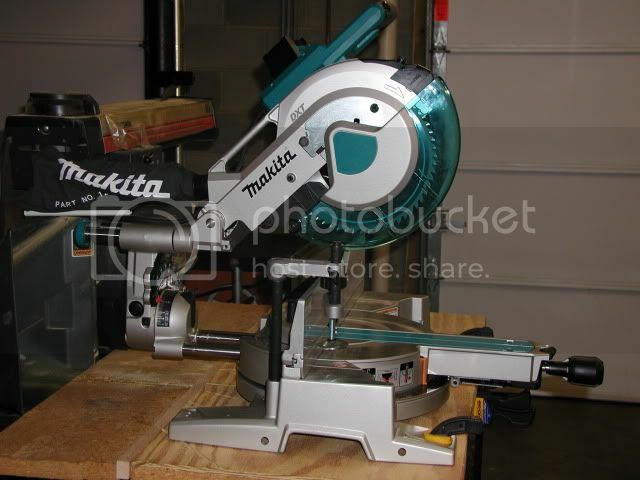 I get mine tomorrow,(tues), can,t wait!..this will be my 3rd makita in 30 yrs. They last..
Randy – you mention a nice point on the modest footprint the saw takes up, and I really like the soft start feature that eliminates jostling your workpiece out of alignment. Rich- I hope ours are running as well in 5 years as they are now. That’s how it should be. Buffalo bill- Let us know how you like it once you get her set up. I feel you will be really pleased with this saw. Thanks for the review. I have the same RAS that you have in the background of this picture and I’m looking to upgrade to a slider for most of the same reasons. I wish I could get the accuracy out of my RAS but it just takes too long to set up and I never trust it. Anyway, thanks for the review, I’ll take into mind all of the things you’ve brought up, it’s a real help! Man that is a nice looking saw. Congrats! Hey Deke- yeah the ability to cut a 4×4 was not there because of motor interference on my old Ryobi miter as well as the RAS. A bit frustrating when you think about it that so many 10 inch saws don’t have that capability. When I did my research that was one thing that was a must have in my book. Dust collection is still a work in progress but I am gaining ground. I have the largest dust hood that Woodcraft carried mounted temporarily on the rear of my RAS deck that you see in the picture, and the saws 1.5 inch port is also hooked into my DC line. This is working okay, but I am either going to dismantle the RAS and just keep the deck and stand and enclose sides and back or build a rolling cart with enclosed back and sides to capture saw dust spray. My research is pointing toward getting this saw. It is currently my leading option, and Home Depot has the best price that I’ve found so far. Thanks for a great review and confirming my opinion. How does this compare to the new Milwaukee one that came out last year? I have a 12 sliding Makita that is about 8 years old and it cuts great…...the track underneath has been stripped many times though cause of my students…kids. I heard good things about Milwaukee when I was looking, but none of the stores had one that I could inspect, and I can’t remember whether they had a 10 inch slider which was a better fit for me personally than a 12. Bosch also has a very nice looking saw, but again at the time I the stores did not have any display models, and since then the ones I have seen were 12 inch model sliders. Thank you. Thank you. I’ve been jumping back and forth between the Bosch and this one. Had made up my mind after seing them both that Makita was the one. It’s about $550 to $575 up here. Then I started seeing some of these Negative Comments on Amazon and a few other places and said OH OH!! I’m not sure you can trust some of these other sites for reliable Ratings. “Fine Woodworking” gave it an Excellent Rating. This might not be good criteria for judging a saw but the Makita just seemed to be a more “Solid” saw then the Bosch and I really liked the Dual Rails Slider and the Drive System. So! Makita it is! Thanks guys!! I have the Makita LS1216L Sliding Mitersaw. I have to say that both saws are well worth the money. I have the same saw and I love it.